Happy New Year's Eve! I don't ever do anything for New Year's, it's not really my thing, but I hope you have something fun planned for tonight! My boyfriend and I will probably watch movies and eat a lot LOL. I haven't decided on a mani yet, but I'm thinking I might incorporate Hard Candy Crush on Amethyst! 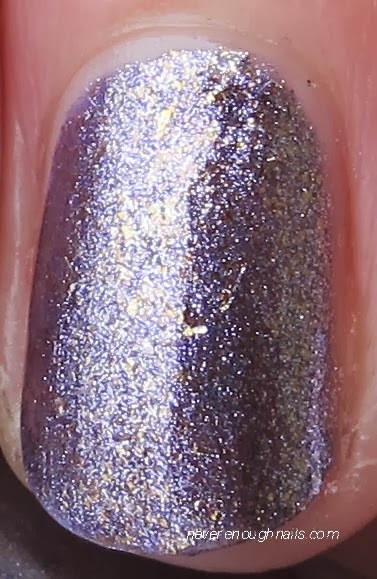 This is a gorgeous purple foil with gold flecks. If you like foils and purple, you should definitely check this beauty out. I got this for Christmas and couldn't wait to check it out, so I think I'll wear it tonight, maybe as a base for some glitter. I haven't worn a Hard Candy polish since high school (back when the brand was at Sephora), so I wasn't sure what to expect. The formula was excellent and Crush on Amethyst was super pigmented! This is two coats, but I probably could have done one thicker coat if I had realized how opaque it was. I was expecting this to be a 3 or 4 coater honestly! The polish wanted to run towards my cuticles a little, but overall, I am impressed. Hard Candy Crush on Amethyst is part of the Crushed Chromes collection. I need to go check the rest of these out at Walmart, I think there are some other colors I need!